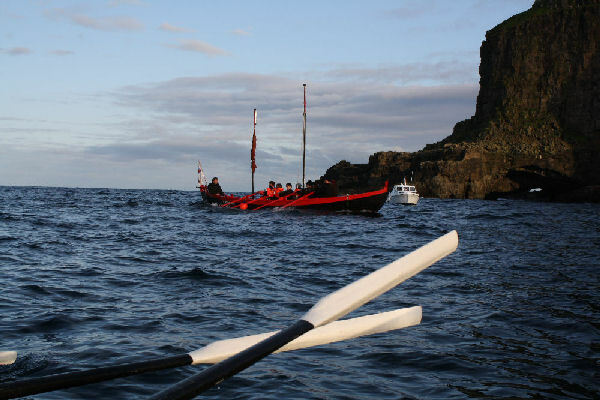 Sildberin (a “sildberi” is a puffin which carries sand launce(s) to its young) was originally built as a 8 oar boat, but was later rebuilt as a 10 oar boat. Sildberin was built by Hans Jacob Hjelm á Løðhamri and Jacob í Nýlendinum in 1903. The boat was registered on 30th of September in 1903 and was also given license to fish cod. The boat was used as a fishing boat as well as a whale hunting boat. The first 8 owners were: Petur Kristian Jacobsen á Oyrarbø, Jákup Danielsen við Ánna Lítlu, Tummas Johan Midjor við Kráir (Lavni við Kráir), Jákup Jacobsen í Nýlendinum, Jákup Jacobsen á Oyri (Jákup hjá Súsonnu), Niklas Danielsen, Hans Pauli Djurhuus (Hans við Hvanndalsá), og Niklas Magnusen (Skómakarin). Later Sildberin was rebuilt as a 10 oar boat and the two new parts were given to Pól Sofus Hovgård and Torvald Hjelm (Torvald hjá Danjali hjá Akka).